Dr. Vikas Raghove, MBBS, Diploma (Anaesthesia), having an experience of 8 years, is the head of department of Critical Care at Mukat Hospital, Chandigarh. 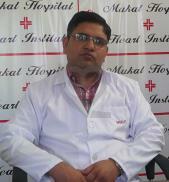 Prior to that, he was associated with IVY Hospital, Mohali & Alchemist Hospital, Panchkula as a Critical care specialist. He is an alumnus of Gujarat University, Ahmedabad, from where he completed his M.B.B.S, followed by a Diploma in Anaesthesia.